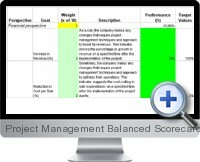 The Project Management Balanced Scorecard for Excel is ideal for comparing projects within an enterprise. Even though the calculation of these indicators present no problems as the data for their calculation is usually available in-house, a special consideration should be given to other projects and ordinary operations that are undertaken by the organization alongside with the project subject to evaluation. It particularly concerns the indicators with financial and customer perspective as they indicate the overall performance of the organization and a lot of factors including external ones may affect them. In respect to the balanced scorecard indicators with internal and growth and development perspective, they are useful while evaluating a separate project as well as while making comparison between the projects undertaken by the organization to measure the company's growth expertise in project management.